May 24-25, 2014. 10 am - 5 pm. In a unique addition to the Doors Open Toronto festival, a weekend in which important public and private buildings open their doors to visitors, this installation opened a window to infrastructure that the festival was unable to physically visit. 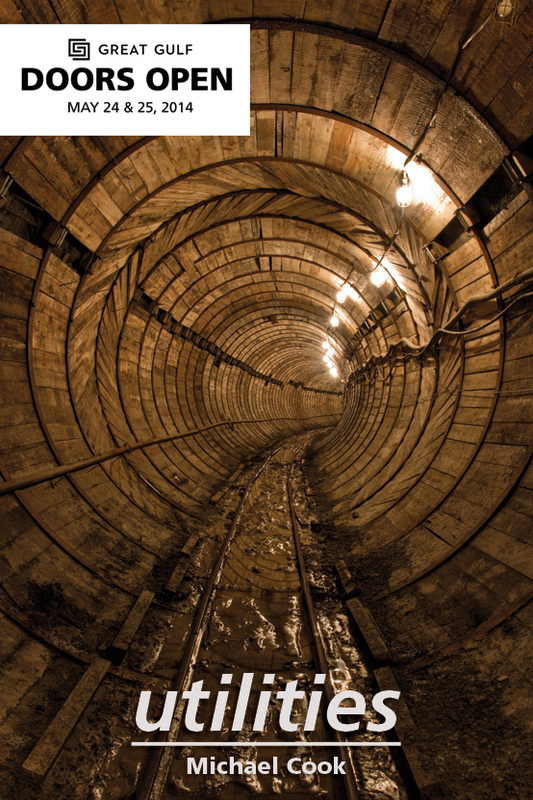 Scenes from Toronto's sewers, cooling and heating distribution tunnels, and a new transmission tunnel under excavation were presented in 10 oversized printed images. These photographs are a window into crucial infrastructure that allows our city to function, and to the human-scale spaces attached to services that we only ever think about in the abstract. For the more than 600 people who visited the installation over the course of the weekend, viewing the photographs was a chance to imagine and think about the systems that make the city work. Please contact my sales agent, Circuit Gallery for information about owning prints of the images in this installation. You may call 647-477-2487, or sales [at] circuitgallery [dot] com (e-mail) them directly.